Acting President Ayşe Kadıoğlu met parents on "Family and Education Day"
Sabancı University's traditional “Family and Education Day” took place at the Sabancı University campus in Tuzla on Saturday, October 22, 2016. Opening remarks were delivered by Professor Ayşe Kadıoğlu, who was recently appointed Acting President. 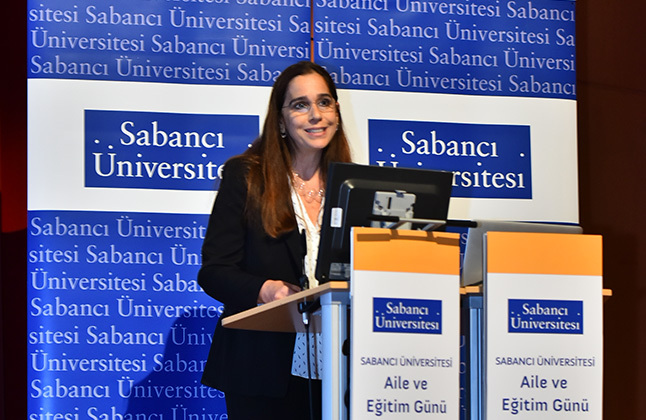 Professor Kadıoğlu said that Sabancı University exposes students to scientific thought, which should be free, critical, creative, flexible and open to dialog. Professor Kadıoğlu continued: "This type of thinking makes one self-confident yet humble at the same time. We are tightly connected with our graduates. We can witness firsthand that they have become self-confident, self-sufficient individuals who step up to solve problems rather than waiting for solutions from others, and are open to dialog." Professor Kadıoğlu concluded by saying: "We believe that our graduates will prioritize dialog, peace and solution over everything, believe in their capabilities as confident individuals, yet hold hands and join forces when necessary." The span4 presentation on the Family and Education Day was made by Professor Batu Erman from the Faculty of Engineering and Natural Sciences. Batu Erman's lecture on "Drug Design and Production in Nanolabs" was followed by Faculty of Engineering and Natural Sciences member Ali Koşar on “SU Pistol and Cancer Treatment". Faculty of Arts and Social Sciences member Assistant Professor Çağla Aydın spoke on “Language, Memory and Psychology”, and the span8 speaker of the day was School of Management Acting Dean Professor Füsun Ülenginon “The Impact of Transport Restrictions in Europe on Turkish Economy”. The 2015-2016 instruction awards were presented to their recipients during the Family and Education Day. The morning session of the Family and Education Day concluded with a mini concert by Sabancı University music club Müzikus. Parents were accompanied by Sabancı University faculty members during lunch, where they found the opportunity to ask questions. The afternoon session included tours of the Information Center and SUNUM, and Faculty Programs.